Editor’s note: This article by Tom McClellan was first published on Jan. 6, 2017, at http://www.mcoscillator.com/. While the Dow Jones may have just won “the race,” many thanks to Mr. McClellan for giving us permission to share his analysis here. I got to wondering recently about all of the NYSE traders on CNBC sporting their “Dow 20,000” hats. Hitting that level seems elusive, but they keep them at the ready. Interestingly, if they would do just a tiny bit of embroidery modification, they could be assured of making those hats useful. Instead of “Dow 20K,” how about “Debt 20T”? It may be just a fun numerical coincidence that the Dow Jones Industrial Average (DJIA) is approaching 20,000 while the total federal debt is approaching $20 trillion, but there it is anyway. Meanwhile, as of the Jan. 5 market close, the DJIA was 101 points away from hitting 20,000. 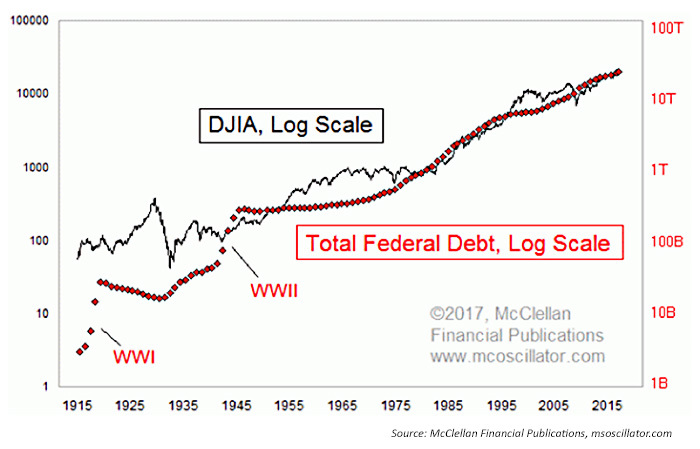 So, in looking at the federal debt versus the Dow Jones, which one do you think is going to hit the big fat round number first? The chart in Figure 1 shows each plot on a logarithmic scaling, and it reveals that the two have been dancing together more than apart. Debt saw a couple of big historical jumps, one for World War I and another for World War II. Otherwise it has been a generally smooth uptrend, roughly in keeping with that of the DJIA. Sometimes the debt is ahead, sometimes the DJIA is. So what? Well, I’ll tell you so what. I don’t have any grandchildren yet but hope to someday, and I already feel bad for borrowing from them to finance our national debt. But what if we did try to reduce the total debt? This next chart is one I have shown before, and it reveals that past attempts to pay off the debt, or to even get close to doing so, have been horrible times for the stock market. When the debt is growing at a rapid rate, that is hugely bullish for the stock market. There is more free money to help elevate stock prices. When the federal government tries to balance the budget, it is problematic for stock prices. The chart in Figure 3 looks back to 1928. We could look back further, but GDP had not been invented before then, and so the GDP data are just not available. Running a budget surplus in 1928 and 1929 helped lead to the Great Depression (red #1 in Figure 3). Attempting to pay off “war bonds” after WWII led to a similar, albeit smaller, slowdown (#2). 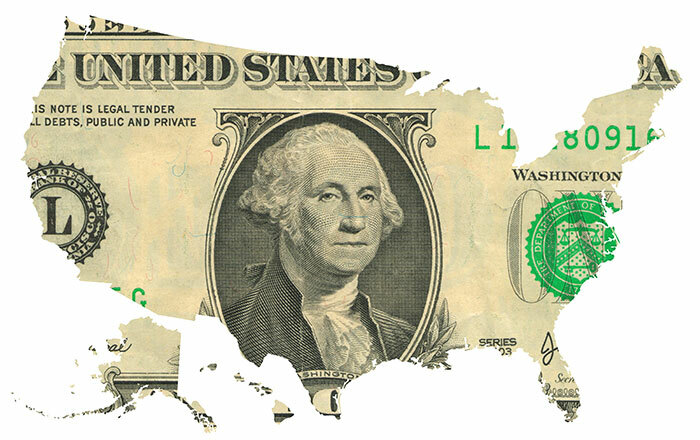 During Eisenhower’s second term (#3), Congress tried to pay for the big Interstate Highway System bill with appropriate taxation, and a big recession ensued in 1957. In 2000 (#4), the Clinton administration supposedly ran a budget surplus, although this was fictional since the total federal debt kept increasing every year. Still, the effect of even getting close to a real balanced budget was enough to kill the internet boom and push the U.S. economy into recession. In the 1920s, the debt was reduced every year for a decade and the stock market loved it, until 1929 came along. 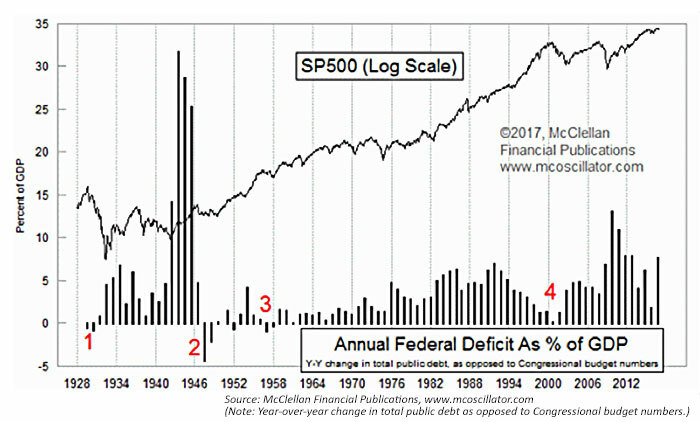 So, it is only a modern inconvenient truth that debt reduction is bearish for the stock market. This highlights a perplexing problem. If anyone thinks that the U.S. ought to pay down its total federal debt, a cause which I incidentally support for the sake of my unborn grandchildren, then he or she had better be ready to accept that this effort will mean a rough time for the stock market, for the wealth effect, the trickle-down wealth effect, and several other economic data series. Paying off debt is unpleasant (duh!). Indeed, it may be too unpleasant for our political leaders to stomach. If that’s the case, how do we ever pay down the debt, and save our grandchildren from suffering due to our profligacy? That’s the big question. Maybe if we can sell enough Dow 20K hats, or Debt 20T hats, we can profit enough off those sales to put a dent in it.